I added DRL to my 2010 Transit connect. My model did not come with factory DRL. Adding the feature was very simple. The factory wiring is included even if the model does not have the option. All you have to do is add the factory relay to the existing DRL circuit. The factory relay number is 5L3T-AA crossreferenced to 5L3Z-14N089-AA. Cost is about 20 dollars. The relay is installed in the Battery Junction Box (BJB) under the hood, behind the battery. Take off the cover to the BJB. The left side of the BJB contains three 5L3T-AA relays. There is a empty socket for a fourth. Plug in your relay and that's it! Awesome info ! ! I'll be making that modification in short order! A little research yields some replacement part numbers if your Ford dealer doesn't have one. Thanks guys! It works like a charm! Got mine too and I will say I like it. But, $23.00 is just ridiculous for that tiny relay !! Mine came with it as an option, so look at it this way: at least you didn't pay $200 or whatever ridiculous price they charged, for a $23 relay. I don't care for it... I like the kind that are only on when the vehicle is in gear. It is annoying to me that the lights are always on as long the van is on. I'm not a fan of DRL either. Does the little "parking" bulb burn when the headlights are on if you don't have DRL? I never noticed that but now I notice it does on mine. I could pull the relay back out of mine and see for myself but I thought I'd just ask first. Yes, my non-DRL vehicle has both the parking bulb and main lamp lit when the engine is running with headlights turned on. Haha, I would, but it's a company vehicle and they spec'd the option so I better not... just in case. I don't like them always on as the Transit Connect does it, because the van spends a fair amount of time idling and I find it could be a potential source of confusion for other drivers near me, who see the lights and assume I am a "vehicle in play" rather than parked. Not to mention drawing unwanted attention to me when I'm just trying to get some darn paperwork done. Yeah, I'm having mixed opinions about the DRL myself. I'll give it a bit before i decide if it stays or goes. 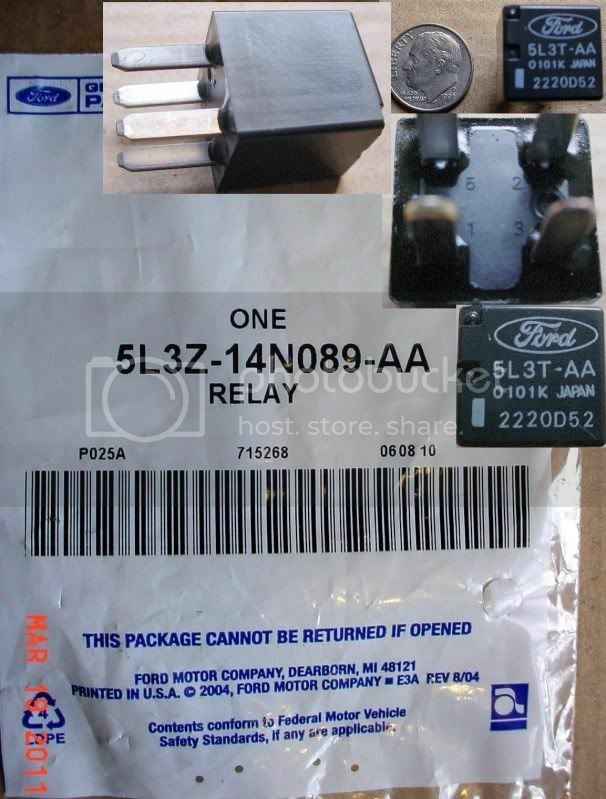 I just got my daylight relay from the Ford dealer today. As others have mentioned, all you have to do is plug it into the "C" slot in the relay box. Both the owner's manual and the diagram on the top inside of the box show you where it is. The guys at Ford parts had no clue you could do this. My back-up light relay went FUBAR yesterday so I swapped the DRL relay into it's place until the next PM @ Ford, then warranty. Actually I don't think I'll put the DRL back on, didn't like it as well as I thought I would. I will make them replace that crazy-high relay though! Hello guys, this is great information, but I'm a bit confused. My TC doesn't have factory installed daytime running lights. On the TC's that have them, where are they located exactly? Are they part of the headlight cluster but just don't work unless the realy is installed, or are they somewhere else entirely? The DRL on the Transit Connect are the low beam headlamps. Once you add the relay, after you start the Transit Connect, the headlamps come on when the headlamp switch is in the off position. Ahhhh... now I see. Thank you very much for the info. I've been following your posts on your quest for front fog lamps. Those Bulgarian inserts looked interesting, but they're no longer on eBay. But it's nice to know the new switch is available in the States now. Thanks again. Hello, in Canada DRL's are mandatory by law. I my self don't care for them. I would like to see if you can re -route the DLR's from the head lights to the front fog/driving lights instead. That would look a lot better. As far as the bulb life goes, the DRL's use less wattage than the actual low beam current. One option would be to flip the switch when you do want them, and leave them off when you don't. Oh wait, that's the stock set-up! Well the price is right, anyway. Bought the $20 + relay for mine then decided I didn't like them and removed it. Came in handy though when the back-up lamps quit. Does anyone know if this option works for the 2014 and newer models? I have the factory option (high beam illuminates at 50%), so probably yes. So there is no relay socket at the dedicated spot in the fuse box at all? Looking at how the salvage fuse box I bought is put together and comparing it to my installed fuse box, trying to add factory options after the fact is likely to be an exercise in frustration. I would have thought it would be more cost effective to standardize the supply side of the box and add relays, fuses, and the load side circuits as needed. If built that way, add ons would be fairly simple. But comparing the two boxes I have access to, they're not built that way. Each only has the exact wires needed for the existing options and nothing more. And since some of the wiring for both the main power supply to some of the accessory relays and the switched power to activate them are done with additional wires crimped in the existing connectors on the underside of the fuse box, it would be very difficult to duplicate the connections without making a hack job of the existing wiring.